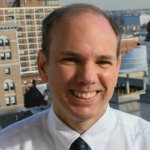 A member of the Catholic Review’s editorial staff from 1997 to 2017, George Matysek has served as a staff writer, senior writer, associate editor and web editor. He was named the Archdiocese of Baltimore’s digital editor in April 2017. George has won more than 70 national and regional journalism awards from the Maryland-Delaware-DC Press Association, the Catholic Press Association, the Associated Church Press and National Right to Life. He has reported from Guyana, Guatemala, Italy, the Czech Republic, Hungary and Poland. A native Baltimorean, George is a proud graduate of Our Lady of Mount Carmel High School in Essex. He holds a bachelor's degree from Loyola University Maryland in Baltimore and a master's degree from UMBC. George, his wife and four children live in Rodgers Forge, where they are parishioners of St. Pius X, Rodgers Forge/St. Mary of the Assumption, Govans.